Purchase an adserver and start your campaign today! Click and see examples of ways to run your campaigns with real examples. All the features of the best ad servering software at your disposal. Control when, where, and to whom, your ads appear with flexible scheduling, delivery limits and a wide variety of advanced targeting options. Schedule campaigns with a start and stop date. Optionally limit them to run on certain days of the week or during specific hours of the day. Set campaigns to run until they reach a certain number of impressions, clicks or actions. Spread impressions evenly across each day of a campaigns flight. Our advanced traffic analyzer ensures that campaigns deliver on time by fitting impression delivery to your traffic patterns. Frequency capping helps prevent your campaigns from becoming over exposed to avoid creative burnout. Display multiple companion ads on a page together at the same time to reinforce an advertisers brand. Avoid showing ads from competing advertisers together on a page at the same time. Target your campaigns by continent, country, state/province, city, zip/postal code, designated marketing area, time zone, operating system, browser, IP address, hostname, page URLs and content themes. Create up to 10 custom fields to pass demographic data as key/value pairs from cookies, databases or other sources to the ad server for targeting and reporting. Matching ads with relevant content can be difficult for ad networks, blogs, forums or large web sites. With contextual targeting it becomes easy. Pages are regularly spidered and full-text indexed, so you can target campaigns to pages with relevant keywords and phrases. Keywords can be required to occur a minimum number of times to guarantee contextual relevance. Easily serve and automatically track impressions and clicks on third-party ads from Atlas, DoubleClick, MediaMind, PointRoll, Zedo and many others! When designing your web site you probably coded placeholders into the spaces where your ads should appear. Each of those spaces is called an ad zone. The purpose of ad zones is twofold: they define the inventory that you have available to sell and they also segment your ad space to allow precise placement control and deeper reporting insights. Some campaigns are more important than others, so it's essential to have a way to convey this to the ad server. AdServer XS gives you ultimate control here by allowing you to have up to 101 tiers within each of your zones! Your higher paying campaigns can be placed in higher tiers, third-party ads can be placed in mid-level tiers and in-house campaigns can be placed in lower tiers. This guarantees that all of your ads get their share of impressions while maximizing your revenue. When multiple campaigns are placed in the same tier you can give them each a priority to control their impression share. In fact, because priorities go from 1 to 100 you can treat them like percentages. For example, you may have one campaign with a priority of 30 and another with a priority of 70 and they would get a 30%/70% split of any impressiosn that fall on that tier. Have a responsive web site that adapts itself to tablet and mobile devices? Your ads should be responsive too! Automatic zone substitution allows different sized zones to be served to your tablet and mobile users. For example, you can have a 970x90 zone for your web users that automatically switches to an alternate 728x90 zone for tablet users or a 320x50 for mobile users. By setting frequency caps on your zones you're able to limit impressions of interruptive forms of advertising such as lightboxes or full page overlays. Consider that you might have several full page overlays that you want to display once per day, but you want to spread them out throughout the day. Simply set a frequency cap of 1 view every 1-2 hours on your zone as well as a frequency cap of 1 view per day on each of your campaigns and this goal can easily be achieved! Certain types of targeting may warrant a campaign to take exclusive priority over others. Take keyword targeting for example. By treating keyword targets as exclusive, you can guarantee that a zone will return a keyword matched campaign when possible rather than showing campaigns that might also match less important targets. Sell your ad space directly to your own advertisers on either a CPM, CPC, CPA or flat rate basis. Charge your advertisers based on impressions using the standard CPM pricing model and you can also pay your publishers a percentage of this rate as well. Charge your advertisers based on total clicks or unique clicks. Charge your advertisers based on total actions or unique actions. What are actions? Commonly they are used to represent leads or sales that are generated after a visitor views or clicks on one of the advertisers ads. Sometimes an advertiser might just want to pay a set amount to run their campaign on your web site for a specified period of time. Flat rate is useful in this type of scenario. You can also define a flat rate to pay out to publishers and it will automatically be distributed amongst your publishers based on their impression share. Haven't sold all of your available inventory? Not to worry! You can choose which ad networks and ad exchanges you want to directly partner with to fill your inventory, so you're not locked into a proprietary solution that doesn't perform for you. Maximizing your revenue from them is easy with tiered priorities. When combining directly sold campaigns with ads sourced from multiple ad networks or ad exchanges, it's essential that the ad server delivers your higher paying campaigns first to maximize your revenue. AdServer XS gives you ultimate control here by allowing you to have up to 101 tiers within each of your ad zones! Your directly sold campaigns that pay premium rates can be placed in higher tiers, ads source from networks or exchanges can be placed into mid-level tiers and in-house campaigns can be placed in lower tiers. Combine this with delivery limits, frequency capping and advanced targeting capabilities and you've got yourself a simply powerful way to optimize revenue. Banners and text ads are great, but you definitely don't want to limit yourself to them. Adding premium creatives like crawlers, expandables, lightboxes, full page overlays, page peels and wallpaper ads is easy to do with AdServer XS. Unlock the full earnings potential of your web site by offering these highly effective creative options to your advertisers. 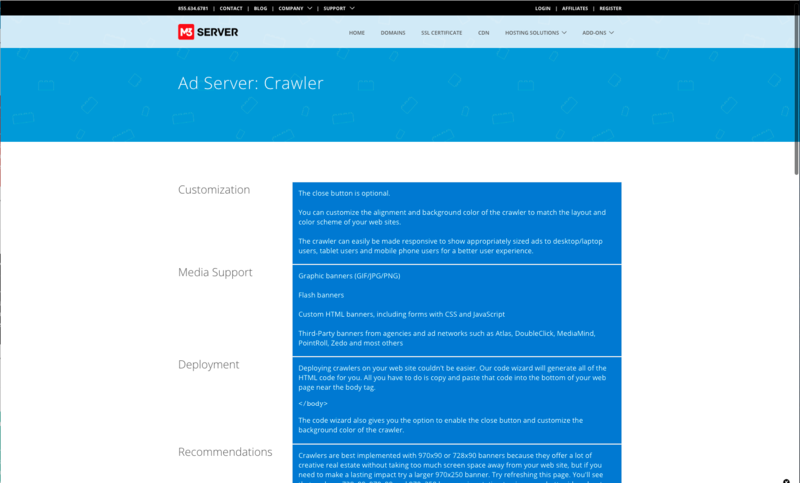 Other ad servers can take up to 24 hours to update your reports. How are you supposed to effectively optimize your campaigns when you're waiting that long for feedback? With real-time reporting you'll be able to spot trends instantly and take advantage of them without delay. You aren't getting the highest possible search engine ranking if you're not serving your ads with AJAX! Google and Yahoo factor page loading speed into their ranking algorithms. AJAX serving allows page content to load first, so your ads will not negatively affect your score. Have a custom search on your web site? You can pass keywords from searches as key/value pairs. Matching ads with relevant content can be difficult for ad networks, blogs, forums or large web sites. With contextual targeting it is easy. Pages are regularly spidered and full-text indexed, so you can target campaigns to pages with relevant keywords and phrases. Keywords can be required to occur a minimum number of times to guarantee contextual relevance. Refining your campaigns to earn maximum profits demands real-time reporting and AdServer XS delivers! Reports can be generated on-demand for any date range and only with the content that you specify. When your report is generated, you can sort data by any column in ascending or descending order too. You can even edit your report to adjust criteria if it's not quite what you wanted without having to re-enter all of your initial criteria. Our reports feature interactive charts and maps that allow you to quickly visualize data. Data is also presented in a familiar spreadsheet format with more detail. This allows you to further analyze data with additional metrics not shown in the charts. Offer your advertisers more effective creative options such as crawlers, expandables, lightboxes, full page overlays, page peels, pre/mid/post-roll video ads and wallpaper ads in addition to traditional banners, text ads and popups and popunders. Preview and test your ads directly from the AdServer XS control panel to verify that they display and click-through correctly before they go live. Integrate ads into your Android and iPhone apps with the same ad serving tags that you use on the web. Target ads by mobile operating system, mobile browser and device type (i.e. tablet or mobile phone). With AdServer XS there is no need to install any software. Easily manage your ads right from your web browser. All major browsers and operating systems are supported: Chrome, Firefox, IE 6+, Opera and Safari on Windows XP/Vista/7/8, Mac OS X or Linux. Do you want the login screen to display your company logo? No problem! Simply send us your logos and we'll install them for you at no additional charge. You can also use a custom domain such as ads.yourdomain.com so it won't be apparent to anyone that you're using AdServer XS. Our user-friendly interface is easy to learn and enables you to complete tasks with minimal steps. Not sure what to enter into that field? Just click on the help icon above the field and we'll instantly pull up all of the relevant help that we have. No need to go hunting through hundreds of pages in a user manual. Quickly locate advertisers, campaigns, media and ad zones with powerful searching capability. If you need help, just click on the support icon and you can access our user manual, search our knowledge base or submit a trouble ticket with just one click! 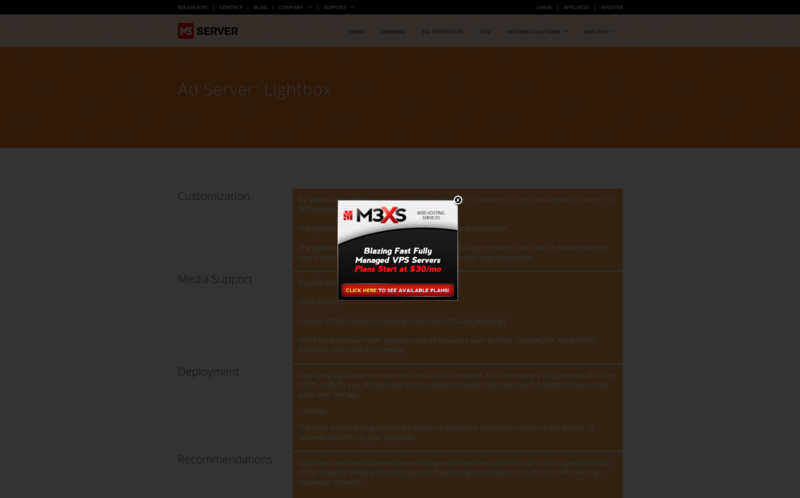 Your web sites can trust AdServer XS for all of their ad serving. We've been in this business a long time and we know that every minute of downtime means lost revenue, so you can rest assured that we're doing everything we can to avoid it. Media files are transparently deployed to and served by a content delivery network with nodes, which ensures your ads load fast for all of your visitors around the world. Multiple redundant backbone connections and the usage of BGP4 routing protocol allows us to provide fast, reliable service with zero packet loss. 3,500 kva PowerWare UPS units provide instant backup power and 1.5 Megawatt Onan diesel power generators are utilized for extended power outages. Fully redundant cooling systems maintain an ideal temperature for optimum server performance. Inergen fire suppressant is utilized to smother fires without causing any of the damage done by messy foams or sprinklers. Secure passage throughout the data centers is insured by Microchip badge access entrances, biometric scanning devices, overhead cameras and motion/heat detection devices. Duplicate backups are created daily and mirrored off-site. Your data is stored on a minimum of 6 hard disks at all times. Should disaster strike, your data is safe and can be recovered quickly. Hackers target ad servers to utilize in the distribution of malware and viruses. AdServer XS stops them dead in their tracks. Is AdServer XS compatible with my CMS software? AdServer XS is fully compatible with all CMS software including Wordpress, Joomla, Drupal, Magnolia, Gossamer Links, Bricolage, Ektron, eZ Publish and Umbraco. Can I serve ads to multiple web sites? Yes, it is permitted to serve ads to an unlimited number of web sites with a single AdServer XS account. Do I need to know HTML to use AdServer XS? The answer to this question is fairly complicated. We recommend that you are at least somewhat familiar with HTML, but it is not required. 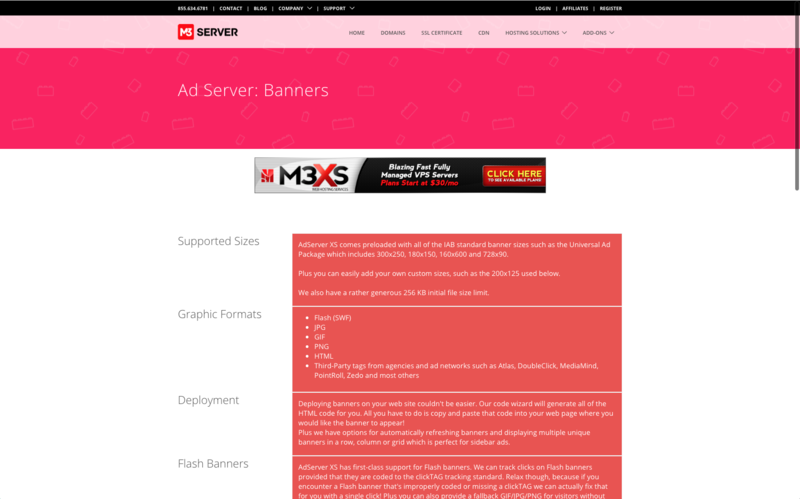 AdServer XS will automatically generate HTML ad serving tags for you. You simply need to know enough to copy and paste that generated HTML code into your web pages where you would like your banners to appear. Am I limited to the IAB standard ad sizes? All of the IAB standard sizes are pre-loaded by default for your convenience. It's possible to easily define your own custom sizes too. You're not stuck with a limited set of sizes like you are with many other ad servers. Is AdServer XS compatible with dynamic web pages?